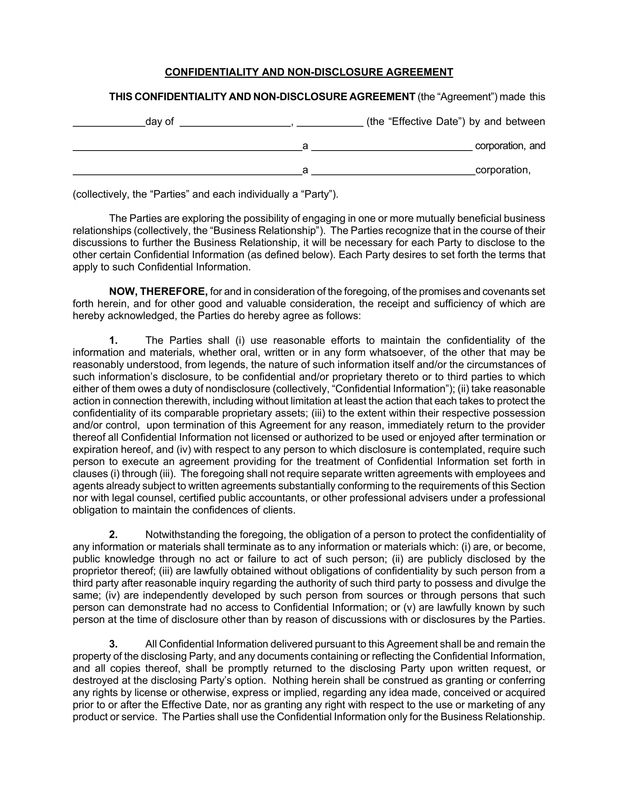 A confidentiality agreement contract form is a document that is commonly used by business enterprises and companies to protect their assets and private information. The form allows the user to acknowledge the regulations and obligations associated with knowing the confidential details of a specific subject. Aside from companies, professional individuals also use this form for their clients who seek for their services. Brokers are professionals who work for real estate matters, insurance, and other subjects that are related to financing and selling assets. Since brokers deal with finance and monetary information, it is important that they keep discussions within the client and themselves only, which is why a broker confidentiality agreement form is created to cater to the broker’s terms and conditions. One of the common inclusions found in this type of agreement contract is a statement regarding the destruction of personal records such as the health information of a client or his financial records associated with the broker’s services upon the contract’s termination. Both the broker and the client or the representing organization of the client must certify and sign the form to indicate that they gave their approval on the varying terms. The main user of this form is a family who aims to hire a nanny or a helper in their home. The form indicates the limitations of the nanny to disclose the personal information of the family. Inclusions in this form are waiver statements, the payment of the attorney’s fees, as well as indemnification and the nanny’s acknowledgment of consideration. 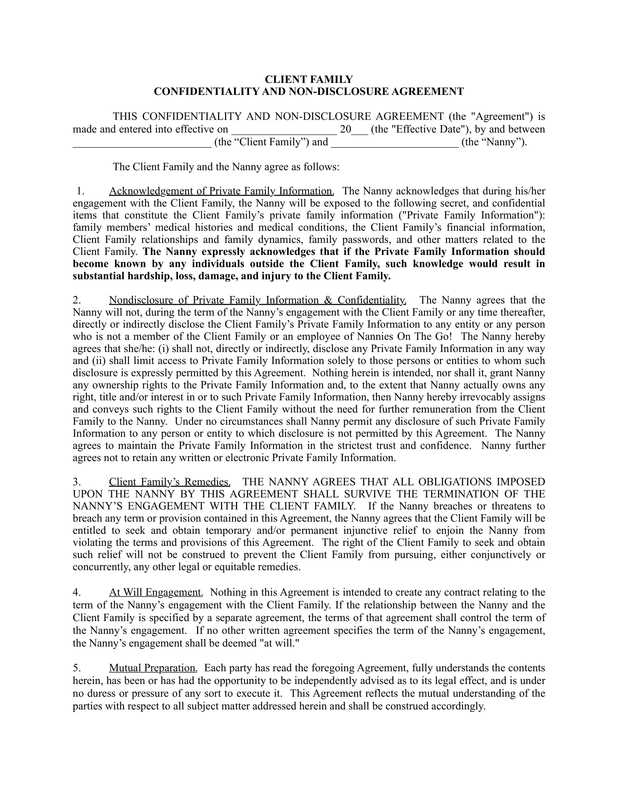 The family’s representing individual must affix his signature on the form along with the nanny’s to certify that the agreement has been informed to both parties and that the terms that are written are approved or understood. Consultants are professionals who help clients into the process of decision-making for improving their lives or for business intentions. 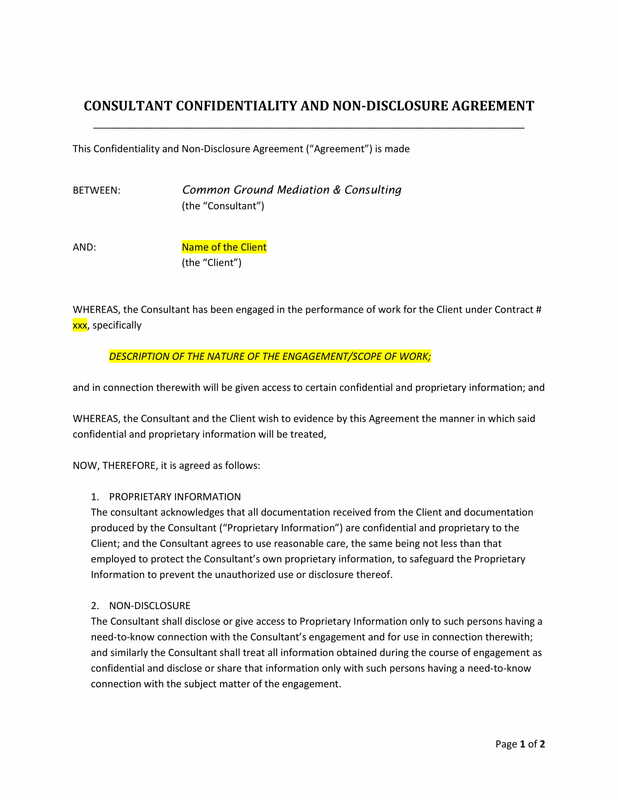 Consultation agencies must have consultant confidentiality agreement forms for their employees and their clients. The form aims to protect the client’s personal information and other related details such as the client’s medical information if the consultation’s subject focuses on advising cure or plans for the client’s medical conditions. 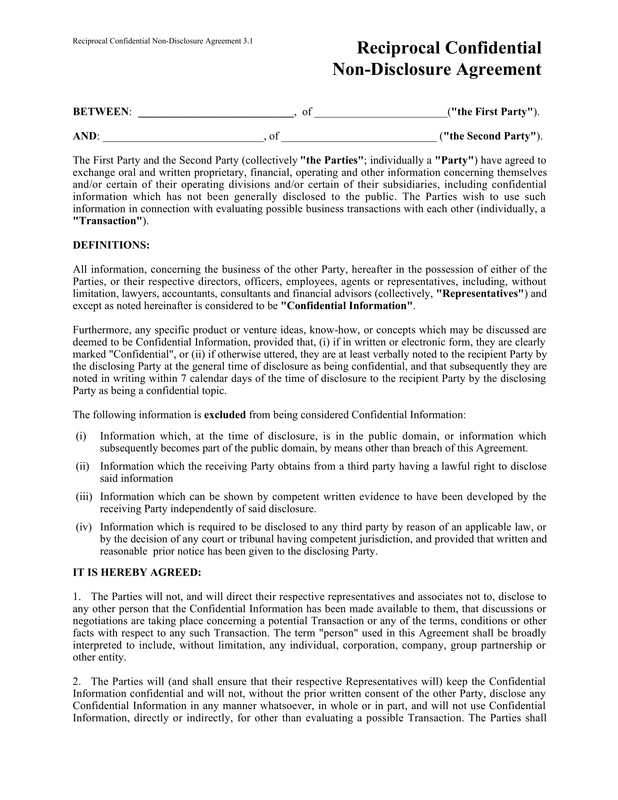 However, compared to other confidentiality agreement documents, this form is shorter and has fewer items to be agreed on by the parties which are namely the propriety information policy, non-disclosure agreement, copies and duplication of documents, clauses of contract termination, and interest in the work product. This type of agreement contract form is used by project contractors to define the parties involved, enlist incidents when information must be protected and withheld, highlight the general contractor clauses, as well as name the supplier’s code of practice. In addition to this, the responsibilities of the parties regarding the security of the information disclosed for the project are also stated on the form with the identification of who is allowed to be informed and given a notice for data and information updates. Any company in the industry must assure that their business secrets and strategies in maintaining their name on top of the ladder are kept only within the company and must be used only by those who are authorized. 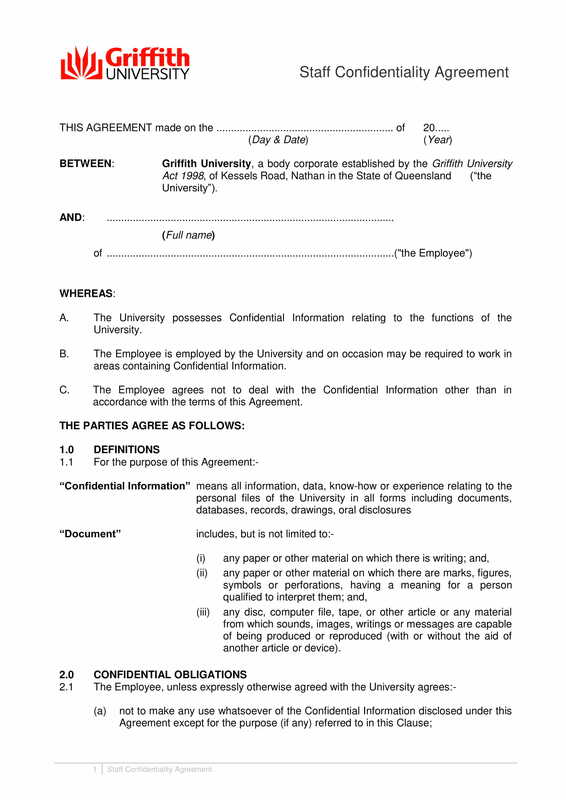 This is when an employee confidentiality agreement form becomes essential to be presented and signed by the employees in the company. This form contains the list of the specific company properties or owned trade secrets that must not be disclosed by the employee to any third party without the legal authorization of the company. Once the employee understands the stated confidentiality terms and conditions, he must indicate the current date along with his signature to complete the agreement. 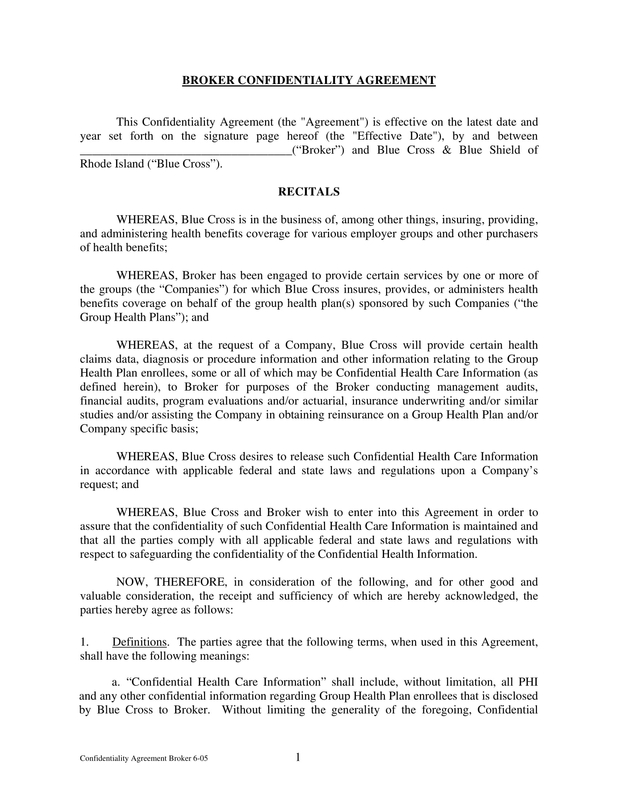 If the intention of both parties is to agree on the terms and conditions that they individually create to assure that benefits are equal, then a reciprocal confidentiality agreement form is the appropriate document to prepare and use. This form includes a section where the secretary of a party will be able to take the minutes of the discussion for the specific confidential information not allowed to be disclosed to any outside entities. The dates of when the meetings are conducted must be stated along with the identity or the name of the party who disclosed the data during the period of the meeting. This allows the secretary to keep a record and determine who will be held liable if there is a breach of the simple agreement contract related to privacy and confidentiality. Business project proposals are not complete without the aid of a researcher and a research assistant. These individuals are responsible for gathering studies, statistics, and data that will be used for the project and will be presented to the board members once a project plan is finalized. 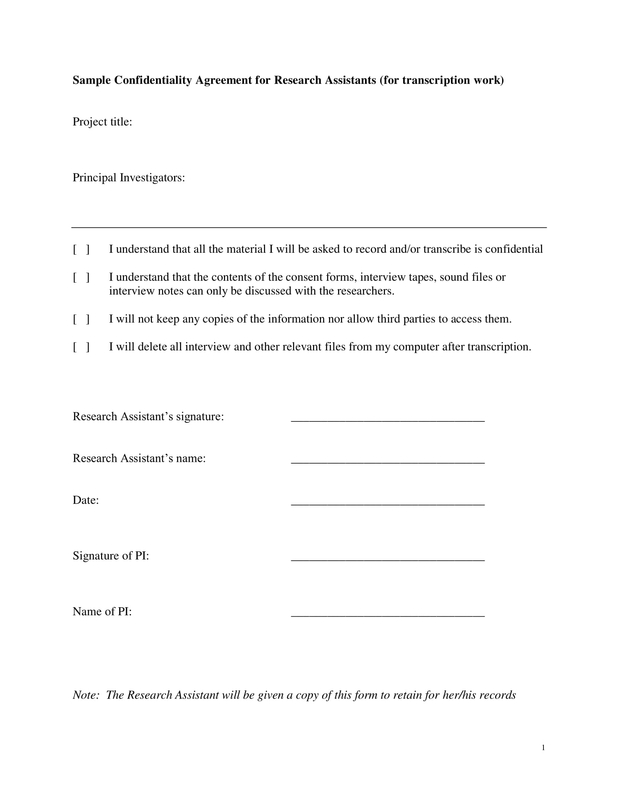 To ensure that the researched output and information are used only for the benefit of the company or the organization who hired the research team, a confidentiality agreement form must be signed by each hired personnel. This agreement contains the title of the project that the personnel is assigned to, the names of the principal investigators, terms and conditions to be acknowledged and understood by the researcher, and the signature of the researcher with the date of when the agreement was signed. Once completed by the researcher, the principal investigator must affix his signature to indicate that the researcher underwent a validation and verification of his responsibilities and obligations. In order for service providers to meet the concerns and the needs of their clients, they must gather their client’s relevant details and information. 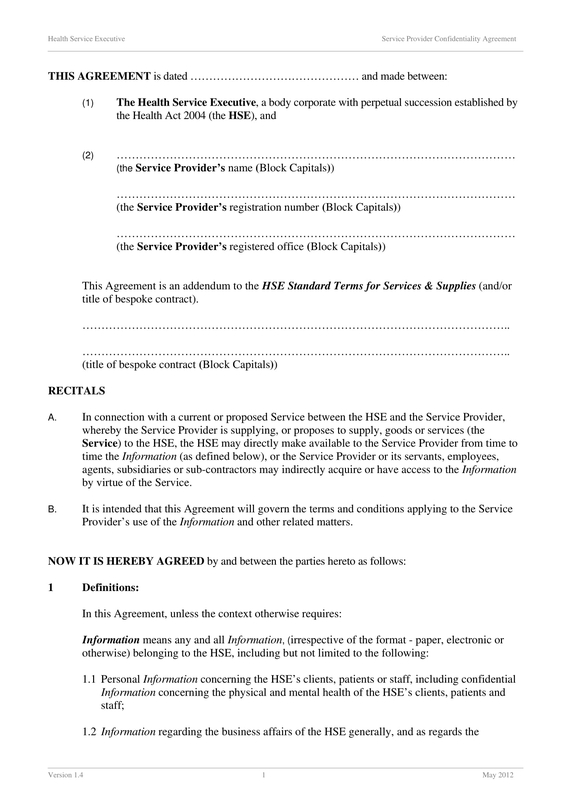 With this, a service provider confidentiality agreement form must be created wherein the name of the service provider with his registration number and office location are disclosed. The definitions of the terms used in the agreement, obligations of the service provider, the required disclosure, warranty, licenses, and severance statements are also found on the form. After the legal statements in the agreement, the parties must sign the form with the presence of a legal witness or an attorney. 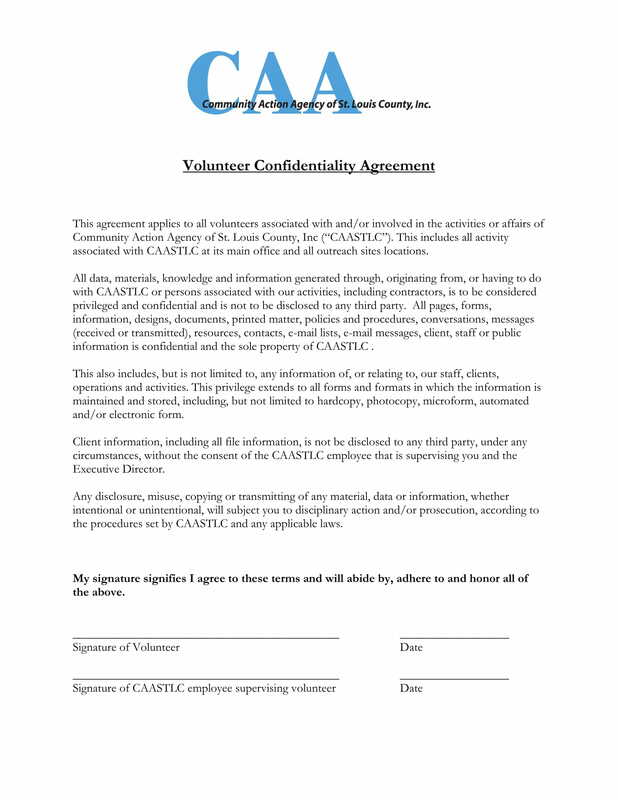 If an organization aims to gather volunteers for their activities and events, then they must create volunteer confidentiality agreement forms first before they will let the volunteers take notes and documents about the group. This form is essential for securing the safety and the protection of the organization’s private data and records. The form is a single-paged document that has the body of a formal letter where the agreement terms are written in plain paragraphs without bullets and numbers, unlike other agreement contracts. The organization’s supervisor and the volunteer must have their signatures on the form for its completion. There are a lot of reasons why agreement contracts are created. However, when it comes to confidentiality agreement contract forms, the most evident reason is due to the benefit that it provides the user security regarding a company’s data and information. Once a breach is known and has been done by the person who agreed and signed on the agreement, the document will be a strong proof that the liabilities must be faced and dealt with the party who executed the breach. On the other hand, when it comes to companies and business enterprises, a confidentiality agreement contract form protects the company’s secrets and ensures that an employee will not use the company’s plans and strategies for other groups opposing the company’s services. Additionally, this form informs the employees that everything that they see, hear, and do must remain within the company and must not be disclosed without the company’s legal consent and authorization.